Congrats to Neil Callaway. UAB's New Coach according to ESPN. -- Greg Adkins -- Currently with the Tennessee Vols. At UT, he has served as tight ends coach, recruiting coordinator and now offensive line coach. Adkins spent five years as an assistant at Georgia under Jim Donnan. He coached the Bulldogs' defensive line in 1996 and oversaw tight ends and the offensive line from 1997-2000. He became the offensive line coach for Donnan in 1999 after Coach Pat Watson's unexpected mid-season death. He was an excellent recruiter for the Dawgs finding hidden gems such as Randy McMichael, Tony Gilbert and Arnold Harrison (if memory serves). Upside - Exceptional recruiter. Understands the Georgia landscape. verstile enough to coach multiple positions including DTs (coached Jason Ferguson and Jermaine Smith for UGA). Downside - Only two years of full, total responsibility for offensive line coaching at the SEC level despite his 8 years in the league. Has a good thing going in Knoxville. Would he have a bad taste in his mouth from his and Donnan's departure? The move would be lateral for Adkins and require a huge financial commitment. -- Jimmy Heggins -- Heggins is currently the Kentucky offensive line coach. However, he's better known for his tenure with FSU from 1986-2004. He coached beside Richt on Bowden's staff for 15 seasons. He has two national championship rings. Upside: Richt would have a pretty good idea of what he was getting. He would also know our offense immediately. UK's offensive line mauled Georgia's defense when it mattered in Lexington this year. Downside: Fired/pressured to resign at FSU after the offensive lines started to slip. FSU hasn't had a dominating offensive line since Van Gorder Halengar left their strength program behind. -- Art Kehoe -- Kehoe is currently the offensive line coach for Ole Miss. A better bio on Kehoe can be found here. Kehoe came to Ole Miss after a 24 year career with the Miami Hurricanes including 20 years as the offensive line coach for all five national championship teams. In a desperation move, Larry Coker fired Kehoe after the 2005 season despite a track record as good or better than any in America. The guy can identify and coach up players from HS, Juco ranks and other positions. Here are some quotes attributed to him over his career. Upside: Did I mention the five National Championships? Plus, he played and/or coached alongside Martinez and Richt in the past. Moving from OL coach at Ole Miss under The Orgeron to OL coach at UGA is *not* a lateral move. It's a return to glory for him. Downside: I have no idea why in the hell Coker fired him. Randy Shannon the new Miami Hurricanes head coach may try and bring Kehoe back to Coral Gables. -- Mac McWhorter -- Texas Longhorn offensive line coach from 2002-today. And yes. That last name is familiar. Pretty sure that Bob McWhorter, Georgia's first All-American in 1913 was his grandfather. Bob was also the former namesake of the old Athletic Dorms. Mac is a Georgia man. His resume is incredible. He's been an offensive line coach at GT and Alabama under Bill Curry. He's coached OL for the 2005 National Champion Longhorns. He's coached at UGA under Goff/McDuffie and at Clemson. He also spent two years at Georgia Tech after Doug Marrone (sp?) left GT to join the UGA staff. He has been a head coach in High School, and at West Georgia College. He served as the interim head coach at Tech for the 2001 Seattle Bowl victory. Upside: An excellent recruiter and position coach with a national title ring and deep Georgia Bulldog ties. After being screwed by Georgia Tech in the search to replace O'Leary, he would have a special place in his heart for clobbering the Yellow Jackets. Downside: Mack Brown has already named McWhorter associate head coach. Pulling assistants away from all that oil money is brutally tough. It would be a lateral move to come back. The only reason to come back would be the call of home. -- Hugh Nall - Hugh Nall is currently Auburn's offensive line coach. He has served as Tuberville's offensive line coach since 1995 when the two worked together at Ole Miss. Nall's Georgia ties run deep as he was a member of the 1980 National Championship team. Excellent eye for talent along the offensive line. Usually produces elite OLs; however, this year has been a bit of a disappointment considering the group had 4 seniors and a junior. Upside - Georgia man. Heck of an OL coach. Solid recruiter. Downside - Overwhelming failure as an offensive coordinator for Auburn in 2003. Extremely loyal to Tuberville. 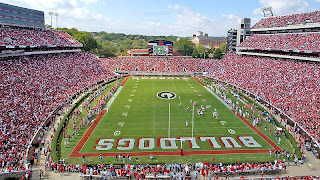 Georgia reportedly tried to lure Nall away when Richt first arrived with no success. Would see that Bobo is "The Chosen One" as a play caller. The move would be lateral for Nall and require a huge financial commitment. -- Chris Scelfo - Scelfo was the head coach at Tulane from '98 to '05. He weathered unbelievable crisis situations as a head coach including multiple threats to cancel the football program and the aftermath of Hurricane Katrina. Prior to joining the staff at Tulane, he was the Offensive Line Coach and Offensive Coordinator at Georgia under Jim Donnan from '96-98. At Georgia, he helped recruit George Foster, Jon Stinchcomb and Jonas Jennings. He also oversaw the transition of Chris Terry from little used defensive end to 2nd Round NFL draft pick. At Georgia, he was the offensive coordinator, but he didn't call the plays. A position he would find himself in again at UGA. Upside - Veteran coach with 20 years experience. Solid teacher of Offensive linemen. Understands the Georgia landscape. Not currently working anywhere else. Downside - Would he want to enter a situation where he knows that he won't be the play caller? Also, is Damon Evans still on speaking terms with Scelfo after Tulane absolutely shat on Georgia regarding the scheduled 2002 and 2003 football games? They canceled the series at the last minute leaving UGA scrambling to find a quality opponent. Who else is out there for us to look at? Err, wasn't Van Halenger the strength coach & not Van Gorder who was up in Michigan somewheres? Scelfo is my choice. He was great at recruiting and Donnan's teams were never the same after he left. hey this might sound crazy but perhaps we could try and get CUTCLIFFE from UT!! I have heard Jeff Bowden's name tossed around as a possible replacement for somebody...but the original rumor was linked to our receivers coach. I have no idea if there is any credibility to this rumor. If memory serves, wasn't Kehoe coaching the OL at Miami when Richt was a player there? He's got my vote. MacWhorter and Nall would be nice pulls, too, but like you said- other than the call of home, why would they? I like all of your suggestions . . . except one.